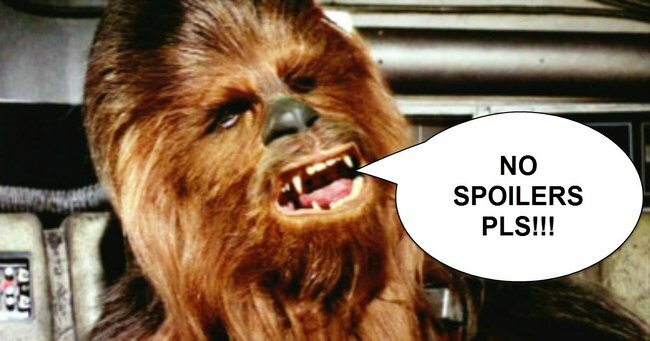 Bugger off with your Star Wars spoilers. The latest instalment in the Star Wars saga premièred around the world last night, which, fan or not, you’ll be aware of if you have an Internet connection. Disney has gone to incredible lengths to keep spoilers for Star Wars Episode VII: The Force Awakens under wraps, while still managing to set global hype levels for the new film to Small Child On Christmas Eve. Attendees at the world première in Los Angeles even had their phones confiscated during the screening. That’s how serious they are about this. And so they should be, did you see the trailer? Today, news feeds have thankfully been full of spoiler-free or at least well-labelled spoiler-inclusive reviews of JJ Abrams’ addition to franchise, which features the original stars and picks up 30 years on from the final film of the first trilogy. All of which have been glowing, I might add. And yet, all is not well in the universe. A bunch of Internet-savvy Sith lord wannabes are threatening a “spoiler jihad” to ruin everything for everyone, just like Jar Jar Binks almost ruined jokes for eternity. The group of “fans”, calling themselves The Alliance to Preserve the Expanded Universe, want Disney and Lucas Films to keep making stories based on their Star Wars Legends fan fiction book series and are encouraging their 3,694 members to see the film and spoil it. So far their demands have fallen as flat as the ill-advised “Jedi Rocks” scene that was added to The Return of The Jedi during remastering. That is how terrible spoiling this film for actual fans is. Yeah, I know. Terrible. As someone who has spent a significant portion of childhood taping the original films onto VHS and re-watching them chronologically every time I managed to swing a day at home from primary school, I can safely say that I am more than a little excited about film numero seven. Almost as excited as I was when some genius re-edited The Phantom Menace to remove Jar Jar Binks’ excess antics and the words “Yippee” and “Oops” from Anakin’s lexicon. This is how I was feeling earlier this week and how I am still feeling because, so far, the Internet has been really solid and kept it’s spoilers to itself. I haven’t gone so far as to download the spoiler-blocking Chrome extension, but I still might (and you can too). In short, NO STAR WARS SPOILERS PLEASE.